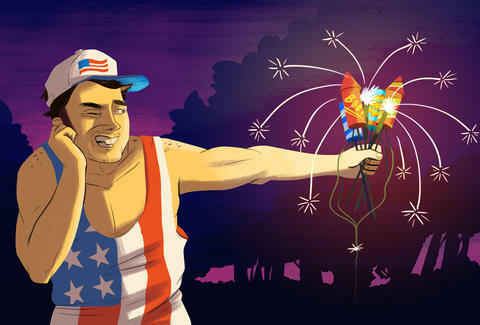 The Fourth of July is a glorious time to spend with friends and family, eating suspiciously charred grilled foodstuffs, reading patriotic poems of yesteryear, and very likely losing at least one of your thumbs in a fireworks-related accident. According to the 11 very cautious moms on the Consumer Product Safety Commission, every Fourth of July weekend, at least 240 people a day go to the emergency room with firework-related injuries. Because we at Thrillist care very much about your arms and torso and eyes and some parts of your weirdly hairless legs, we’re presenting a logical guide to not becoming one of those unlucky people who flew too close to the Z-firing fan cake. In order to procure hot safety tips firsthand, I called my local fire department’s non-emergency number. 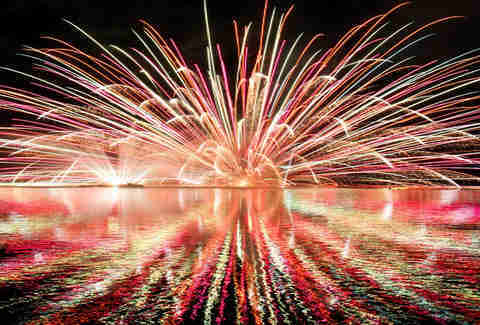 When I asked for a few guidelines, I was told that, in California, only “safe and sane” fireworks are legal. I followed up, asking for a definition, and “Frank” (I’ve changed his name because he did not want to be named in this story and told me explicitly that he’s “wary” of the “media”) on the other end clearly did some silent Googling, and eventually came back with a list of things like sparklers, snaps, smoke balls, and fountains. It seems actual rockets and firecrackers, and anything you normally associate with fireworks, are illegal here. Frank was silent for an awkwardly long period of time, and I actually thought he’d hung up on me when he cleared his throat. “I’ve got a few things,” he said tentatively, and then sniffed a little. He could’ve been crying, I don’t know Frank that well and am not sure what’s going on in his life. This seems like it should be a no-brainer, but apparently a lot of people shoot off bottle rockets that end up hitting other people’s roofs and causing fires and neighborly fisticuffs. “Lots of fires and injuries happen when teenagers do this in crowded suburbs,” says Frank. I don’t know why he needed to get a jab in at teenagers there, but the point remains: find a safe open area, like a baseball diamond or the bottom of your empty Olympic-sized swimming pool. 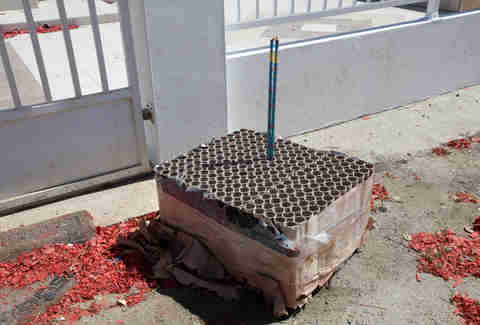 Never attempt to relight "duds"
A lot of injuries happen when fireworks don’t go off, and people try and relight them. This is one of the many reasons you should keep a bucket of water and a hose nearby. “If something isn’t lighting, do NOT try again,” says Frank, emphatically. Frank said that you should wait a half hour and then throw the dud firework into the bucket. Frank did not get into what you should do during that half hour, though I’d like to think that he would use it to re-read one of his favorite Frederick Forsyth thrillers on his Kindle Fire while absentmindedly fiddling with the buttons on his Tommy Bahama "Breaking Waves" short sleeve shirt, his mind occasionally wandering back to the whereabouts of Gloria from his high school in Bakersfield. She was too good for Sam, Frank might think. She was too good for all of us. Read the warning labels and "performance descriptions"
I guess a lot of people just kind of look at their “King Bird Bad Mother Truck 18 Shot Cake” fireworks and think, “This seems pretty basic.” That’s when they lose a hand. 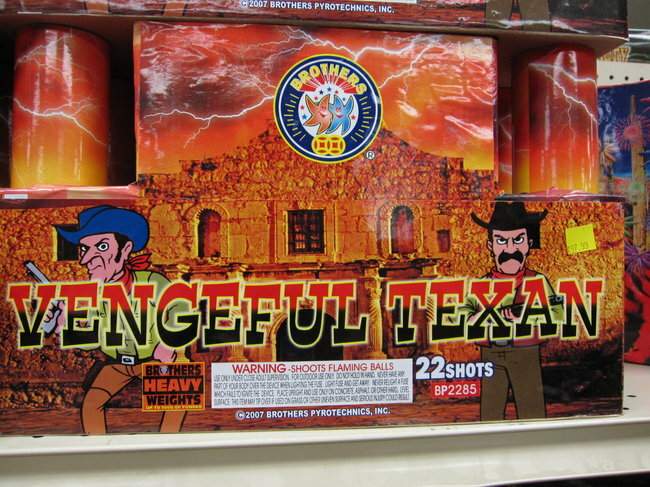 Even the Vengeful Texan helpfully proclaims, "WARNING - SHOOTS FLAMING BALLS." “If you don’t understand what your firework is supposed to do, how will you know if something goes wrong?" Frank asks, employing a rhetorical tactic he might’ve seen on Matlock. “You won’t,” I said back emphatically, as it felt like that statement needed some closure. “Exactly,” Frank said, seeming quite pleased. Frank says that safety glasses are a must. “15% of the time, injuries occur to the eyes,” he said confidently, and I realized he’d definitely Googled that stat. As for lighting one at a time, if you don't understand that part, this entire exercise is likely futile. If you’re making your own fireworks, you need to find better things to do with your time. “Homemade fireworks are unpredictable,” says Frank, the disdain evident in his voice. "They could go off whenever." Instead of spending your time building dangerous explosives, you should do like Frank does* and head to your nearest casino to play Keno and drink off-brand whiskey while whistling appreciatively at the waitresses. He didn’t though. He just hung up. Kevin Alexander is Thrillist's National Writer-at-Large and feels like he and Frank are at the precipice of a deep and everlasting friendship. If you are Frank, DM him @KAlexander03.